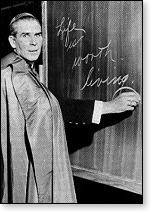 The Servant of God, Bishop Fulton J. Sheen, used to tell the story of Felix and Elisabeth Leseur. Felix was a very anti-religious man. His wife was a holy woman who loved him. And she offered all she had and was and all her sufferings with cancer for his salvation and conversion. After her death, he discovered her journal and came to know of her sacrifices for his soul. He would convert and become a Dominican Priest. Here is but a very small writing of hers followed by their story from Bishop Sheen. Not only in fulfilling my responsi­bilities to everyone, not only in charitable work, not only in prayer, but in my whole attitude and way of life. Great and holy ideas and deep convictions often influence others only through the attractiveness of those who embody them. “You will know them by their fruits” (Mt 7: 16), our Savior said: by the fruits of devotion, charity, and radiant faith, and also by those blossoms that first attract notice and precede the fruit; those are called tender love, graciousness, social refinement, serenity, equanimity, friendliness, joy, and simplicity. A truly holy person – mistress, by divine grace, of her body and its challenges – without ever speaking, exudes the delicate perfume of these flowers. Such a person attracts others by her gentle influence and prepares them for God’s approach, which she eventually obtains for them through her prayers. She repeated her words and passed away. She died in her husband’s arms at the early age of 47. Dr. Leseur, the atheist, dismissed her will as the fancies of a pious woman. He decided to write a book against Lourdes. He went down to Lourdes to write against Our Lady. He saw it all. At once. In the year 1924, during Lent, I, Fulton J. Sheen, made my retreat in the Dominican monastery in Belgium. Four times each day, and 45 minutes in length, I made my retreat under the spiritual guidance of Father Felix Leseur of the Order of Preachers, Catholic Dominican priest, who told me this story. Nota Bene: The cause of Elisabeth Leseur’s canonization is proceeding in Rome. Fr. Leseur died a priest in 1950. Dear Lord, please bless our world with more souls like hers.